The City of Clare, in partnership with Mid Michigan Community Action Agency is in the midst of a major project to renovate Clare's historic, rail depot. The depot was built by the Ann Arbor and Pere Marquette railroad companies in 1895 and was moved 1800 feet in April 2014 across from Clare Castle Senior Center on 4th Street and closer to the center of town. Mid Michigan Community Action contributed a portion of the land on which the depot now stands. Clare looks forward to the rehabilitated depot as it promises to add significant historical and cultural presence to the downtown area. The building will contain offices for organizations such as the Clare Chamber of Commerce and Clare County Arts Council, house a railroad museum, and provide a meeting room on the lower level. 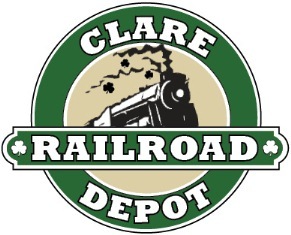 In addition, the depot will serve as a hub for the Pere Marquette Rail Trail that will eventually run through Clare, connecting Midland to the east and Reed City to the west.